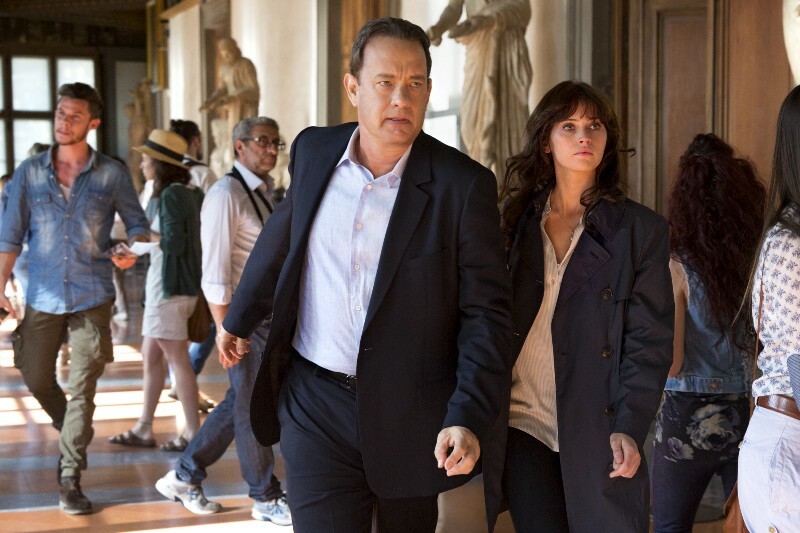 Inferno the movie based on the novel of the same name by Dan Brown, hits theatres this weekend. Care to catch up on some trivia? Here goes! 1. 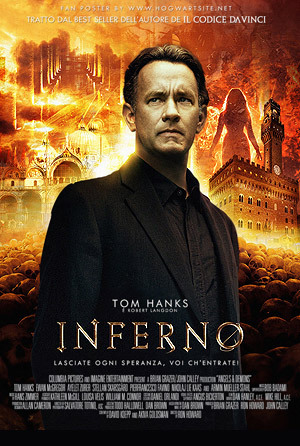 'Inferno' is the fourth book of the Robert Langdon's saga. But it is the third one to be adapted for a film. The third book featuring Langdon, The Lost Symbol was the least popular in the series. No wonder it never made it onto the screen! 2.During location filming, the film's codename was "Headache". 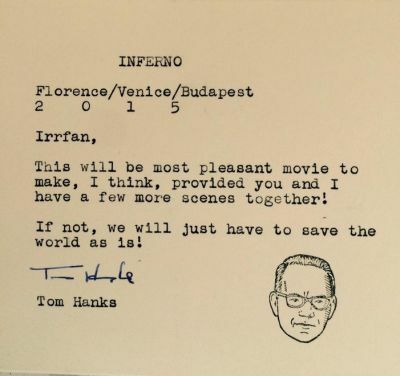 Tom Hanks in Inferno, saving the world – one symbol at a time! 3. Irrfan Khan plays the 'Provost' in the movie. Irrfan Khan as the Provost in Inferno. 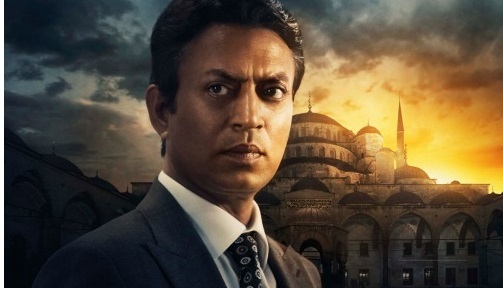 Irrfan Khan was actually supposed to play another role, but he specifically requested Ron Howard, the Director, to give him the role of the Provost, Harry Sims. 4. Tom Hanks wrote a special note to Irrfan Khan, welcoming him to the sets on his first day. The note written by Tom Hanks to Irrfan Khan. Note the face stamp he put at the bottom right! 5. An exclusive trailer was created for Indian audiences. This here is a trailer specifically crafted to appeal to Indian audiences. In other words, there's a lot more Irrfan Khan… his is the ominous voice we hear at the end. 6. The ending is different! *SPOILER ALERT* So the world doesn't get infected by the sterility virus then? Reportedly, early reviews say that the ending is different from the one given in the books… and it's a much more optimistic one. "Where book readers might expect the bad guys by the end to turn out to be characters A, B, and C, instead it transpires they’re actually X, Y and sort of Z. ", says one review. 7. 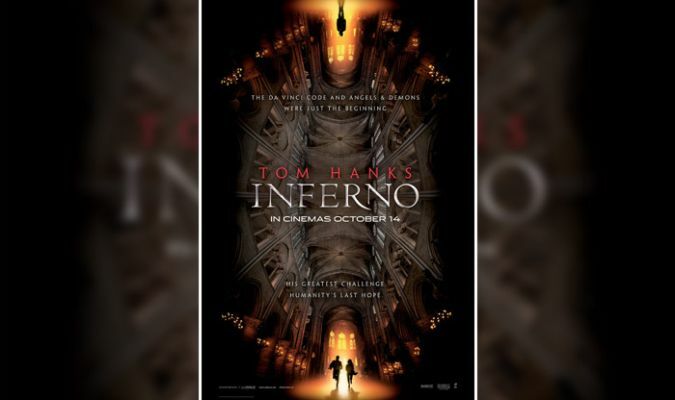 "Inferno" the movie releases this Friday in India… 2 weeks before the US release. Get ready for some thrills and chills this Friday… Dan Brown style. The US release date is October 28th, but we'll get to see Robert Langdon – and Felicity Jones as Sienna Brooks – a full two weeks earlier. Are you excited? We certainly are!